Spring is coming. It’s time for more sunshine and brighter colors. I hope the card I created for the Ellen Hutson March Mix It Up Challenge with Pretty Pink Posh reflects this. I focused on creating a blue sky with a hint of haze from clouds and the fresh green color of spring grass. I added a cute baby chick as well and was going for a bright, but soft fresh look. The sky and grass were colored using Distress inks in Tumbled Grass and Twisted Citron and a blending tool. The chick is from Pretty Pink Posh’s Birdie Notes stamp set and is colored with Copics (Y13, Y18, and Y38). The sun smiling down on the chick is from Ellen Hutson’s All Inside stamp set and is stamped onto Papertrey Ink’s Summer Sunrise cardstock and die-cut from the coordinating die. I have a rubber stamp that has tufts of grass and used it to create more dimension (grass) on the ground. That little stamp comes in very handy at time. The sentiment is actually from 2 stamp sets. 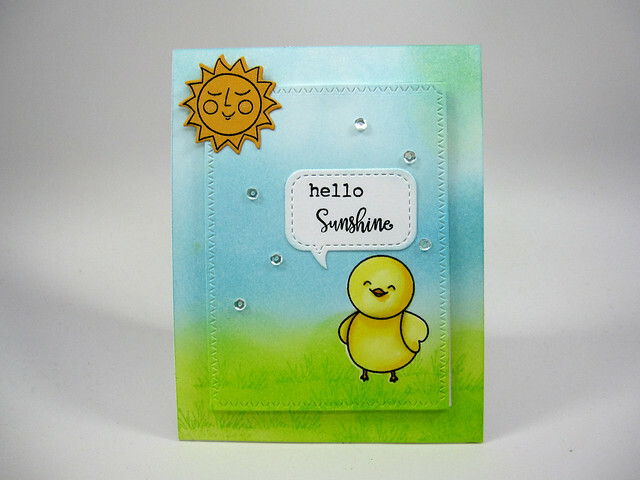 The “hello” is from Ellen Hutson’s All inside and the word “Sunshine” from Pretty Pink Posh’s Rainy Days stamp set. The sentiment was stamped onto a die-cut piece using Pretty Pink Posh’s Stitched Speech Bubbles die set. I stamped and colored the front of an A2 piece of cardstock and after the coloring was all done, I die-cut the center of the card using a die from My Favorite Thing’s Zig Zag Stitched Rectangle Stax set. I then mounted the cut piece onto foam board and glued it back into place. The foam board raises the center area of the card and gives the card front a nice bit of dimension. The sun was attached to the raised panel of the card front and embellished with a Wink of Stella pen in clear. Finishing touches wouldn’t be complete without adding some sequins for a bit of glimmer. Stamps: Ellen Hutson: All Inside stamp set (for the sun and word “hello”); Pretty Pink Posh: Birdie notes (chick), Rainy Days stamp set (for the word “Sunshine”). Inks: Distress Inks: Tumbled Glass (sky), Twisted Citron (grass); Memento Ink in Tuxedo Black (for the images). Copic Markers in Y13 (Lemon Yellow), Y18 (Lightning Yellow), Y38 (Honey) for the chick. Dies: Ellen Hutson coordinating dies to the All Inside stamp set; Pretty Pink Posh: Stitched Speech Bubbles die set; My Favorite Things: Zig Zag Stitched Rectangle Stax. Cardstock: Neenah Solar White 80# (card front) and 110# cardstock (card base); Papertrey Ink: Summer Sunrise. Other: Wink of Stella (clear); Pretty Pink Posh Sequins (clear). This entry was posted in Hello/Thinking of You, Seasons and tagged Essentials by Ellen, My Favorite Things, Papertrey Ink, Pretty Pink Posh. Bookmark the permalink.